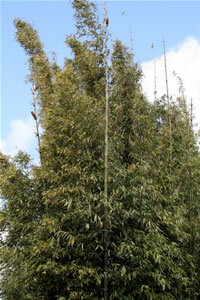 For an alternative to wooden fencing why not choose a bamboo privacy fence? These types of fences are often chosen when designing a Japanese Zen garden effect, or simply because bamboos create a serene and relaxing air of the tropical. These fences and screens are more popular as a green alternative to wood as they are made from plants that mature quickly. Making good use of these products helps prevent the global destruction of our much needed forests and woodland. 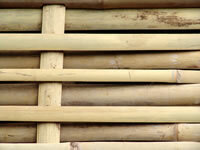 In considering a bamboo privacy fence there are a couple of avenues you can explore. 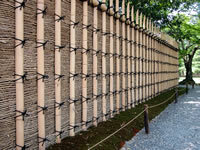 The first is the types of fencing made from bamboos as can be seen in the example images and further down this page. Rolled fencing is practically ready made and is really fast to erect. Or, you could go for live fencing and plant some suitable species according to the height of living fencing that would suit your garden. The screen in the image on the right was put there to provide a bamboo privacy fence between my friends garden and the neighbour. Living screens have the added benefit of blocking out the sight and sounds of traffic noise. The result is very attractive in the sense that not only does it mean that it prevents others from seeing into your garden but it also makes your garden much quieter if you live by a road. See Plants for Sale and Fence Panels to estimate how much it may cost in these two types of fencing. As with any product made from natural materials, it will age and fade. It will last for years if you provide it with the same level of maintenance you would expect to give to protect a wooden fence from elements such as sun, wind, rain, and snow. Do ask about care of your fencing from your supplier and they will recommend a product suitable for your climate and geographical area. If you fancy building your own fencing please visit my bamboo fence building page for some tips on building and my other page on bamboo fencing design. Live fences do not require so much care provided you start out with the correct species for your required height and breadth of fencing. I have provided lists of species and their growth habits, including height and colour, on the following pages in this site. Bamboo Hedge and Bamboo Windbreak.